Grip-Tuth® hair combs keep all types of hair in place because the teeth touch each other, leaving no room for hair to slide out. Specify color: clear or tortoise. Plastic. 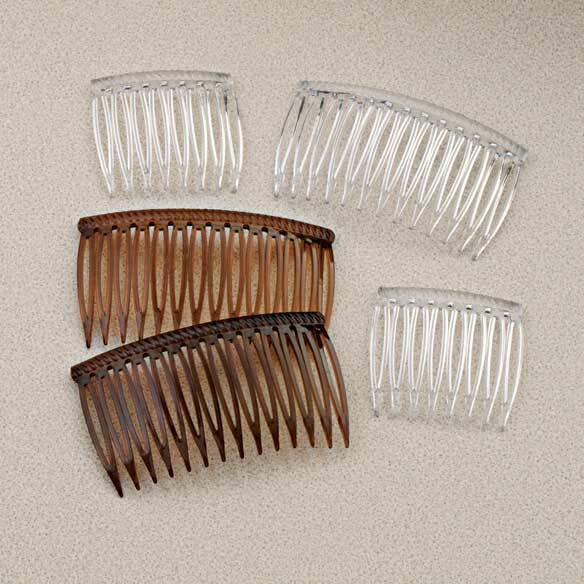 Small plastic hair combs are 1 1/2" W, Large are 2 3/4" W. Set of 2. I got these small combs because the larger ones are too large for my small head and the combs show, these small ones are great they hold the hair real well, and stay where you put them I've forgotten to take them out when I was exhausted and just fell into bed one night and they were still right where they had been placed when I woke up. I got a set of both colors, It would be nice to have them in basic colors plus pink and purple to match some of my outfits! They even stayed in my hair under a hard hat! I love these combs. I can see the marketing points. The teeth are completely touching which make them work well. I have lots of combs that never stay in. The only thing I was disappointed in was the size. I thought they would be bigger. However, it clearly states the dimensions, so pay attention. Maybe in the future they will make larger ones which would be great. I use to hold my hair back and to hold my hair up. I use these combs everyday and feel very comfortable. good product- wish the color was a brownish and not so golden. Use this to hold my hair on the sides when I drive my Gator in the pasture. They are perfect for my hair. I have been searching for these items everywhere. I am so happy that I finally found them. Because you can't find this size in the store!! My ancient hair combs are breaking. I need new ones. I hope these are satisfactory. I have used this product for years . Finally, mine have last a tooth or two and need to replace . Items for fine hair are difficult to find, believe me. I like wearing my hair up and the combs are terrific. I have a familly member who cannot use barrettes. I have this item already and it works very well for my thin hair and is unobtrusive. Need combs for very thin hair. The posted reviews say these combs will hold any type of hair. In the past have purchased many combs that have not worked. Keeping my fingers crossed that have found combs that will serve my needs. Have just reordered as reviews were accurate...best combs ever. I love the small size. They work better than I every imagined. I have a smaller head and all I can find in stores are bigger combs. I have been looking for clear combs since I let my gray hair grow out ..so happy to have found these ! I am letting my hair grow out but can not stand it in my face. I have been looking for these type of combs for a year. Finally found them on you site. Cannot find these small combs in any retail store. Happy to find them online. Tried drugstore side combs and they kept falling out. Exactly what I was looking for @ a good price! size and color I wanted. I have extremely thin, fine hair. These combs stay in all day long. I love them! I heard that they stay in fine hair. Am trying it out to see if it is true. Because I needed combs to hold my hair back and these looked like what I needed. I am trying a longer hair style and have fine hair. Bought some of these a year ago and they work well. Hoping the teeth don't break with normal use. I've been looking for these for my hair. This store is the only place I've found. The other evaluations were so complementary that I trusted that the combs would be exactly what I want.. I'm growing my hair out & need these. The only site I have been able to find this size of comb. Will these be good under wigs to get through security gate on airlines? BEST ANSWER: They are plastic so they should not be a problem. You can ask on the TSH site. I haven't used them under wigs, but I certainly have used them through airport security checks many times in many countries with never a question or other problem. I like them because they really do grip securely all day and don't "ease" loose. yes, though you might need to use a few more than usual to hold the weight if a wig. They should because they are plastic! That should be the TSA Web site. what is size of large combs? BEST ANSWER: Thank you for your question. The Large size is 2 3/4". We hope this information will be of help to you. Do you have the ONLY white hair combs available? BEST ANSWER: Thank you for your question. No we do not. We only have the multi pack. We hope this information will be of help to you.